Cornell Cooperative Extension, Suffolk County Farm and Education Center is a working farm and education facility that is open to the public year round. It is the first certified Nature Explore classroom in the state of New York that is located on a model farm educational facility and century old working farm. In May of 2010, during the annual Baby Animal Day celebration, information was shared with approximately 400 guests at a public unveiling which highlighted the first areas of the Nature Explore Classroom. A series of nine weekly classes were held in the Nature Explore Classroom during a session of the Early Childhood program, with each class focusing on a specific area in the classroom. This allowed children to become familiar with the classroom while parents learned about the importance of outdoor play, unstructured play, nature education and the guiding principles which form a Nature Explore Classroom. The area picked for the new outdoor classroom has many existing plantings, trees, and well established gardens. A hand-crafted log and branch entry feature welcomes families and groups into this inviting, nature-rich space. A workshop was conducted for families to “Leave their Mark in History”. This provided an opportunity to make and decorate stepping stones which were placed at the entrance to the classroom. Children and families also participated in planting additional flowers, including sunflowers for a special Sunflower House. Hand-made wooden signs, in the shape of farm animals, mark the entrance to each of the areas. 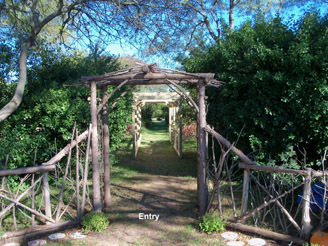 These separate areas are partitioned using plants, logs and split rail fencing. 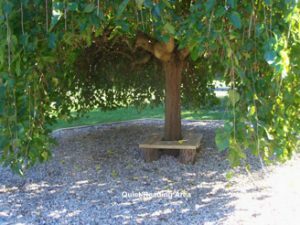 Some of the dividing structures can also be utilized as seating in the area.Larger trees border the sides of the classroom with a Weeping Mulberry, located in the middle of the classroom providing a secret and quiet reading space. Located on Long Island, this classroom reflects elements of fishing and boating which are major industries to the area. A wooden sailboat adds aesthetic charm to the Climbing Area while a sand play area represents the South Shore and a pea gravel play area represents the rocky North Shore. A slide, positioned over a large berm, creates a safe and interesting addition to the Climbing Area. The Music and Movement Area contains a raised stage that sits on a large, wide berm. The added height creates a wonderful dimension for children to experience the world around them. Children create evaporative art masterpieces on large, mounted slates in the Nature Art Area. Many mediums are available in this area to help inspire children to tap into their creativity. Suffolk County Farm and Education Center is excited for a new season to begin as their new classroom brings many additional ways for families to connect with nature.